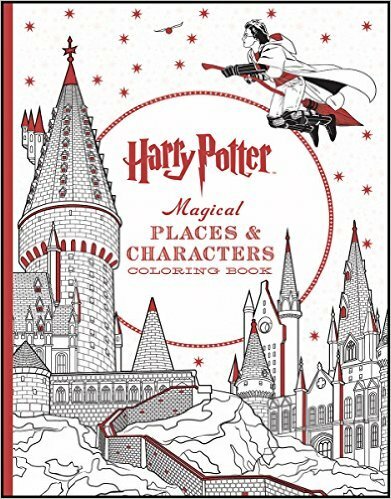 Rather than discuss how this is like or different from the books and/or movie series except to note that, once again, most of the iconic images seem to be taken primarily from the movie, I will discuss only how I feel about it as an adult coloring book. As with the first two books in this series, there is a team of illustrators involved with the designs in this book. I thought the second book in the series was fairly cohesive but I think this new book takes a step back again. It is easy to see the differences in design styles. There are some designs that are just a tad more detailed than simple line drawings while there are also many which involve extremely small and intricate elements. These will probably take sharp pointed pencils or ultra-fine nibs to color. This review is for the 30 design set of glue-bound coloring postcards. I will address the differences between this and the 50 design postcard set towards the end up this review. The silent video with this review will show what is included with this set. This set of 30 postcards is based on Millie Marotta’s Animal Kingdom coloring book. This was her first and hugely successful book though at this time she has two others and a fourth one planned for this year. The subject of the postcards are a wide variety of animals from land, sea, and sky. The cards are all from the book and vary from full designs which have been shrunk to fit the new size or which are a subset of the original design (and possibly smaller, too, but not to the same degree as the full designs.) Some of the designs contain many extremely small and intricate details. I was able to use my 0.38 and smaller gel pens and Verithins to easily color in those spots. This may not be a set for anyone with vision or fine motor skills issues. The cover of the cards is beautiful and is a small version of what was on the coloring book. It has very pretty gold foil touches. Unlike the book, the postcards are definitely printed on only one side. The size is perfect for use as a postcard or to color and frame to make small gifts or a collage of prints on a wall. The back of the design is pre-set for postcard information. The postcards are glue-bound and you pull a card off like you would a note from a notepad. Alcohol-based markers bleed through. My water-based markers, India ink pens, and gel pens did not bleed through. Gel pens definitely need extra drying time. Coloring pencils work well. I could blend my soft lead pencils but the real issue is a matter of having enough design room to utilize blending. My hard lead pencils worked like a dream and were great for coloring in small areas. There are two sets of postcards based on Animal Kingdom: this one which is a 30 design glue-bound set and a slightly more expensive set of 50 designs which are loose-leaf and come with a nicely decorated heavy-duty cardboard holder. I bought this set to have with me on-the go. I like that it is glue bound rather than loose leaf as it will stay together in my tote. There are really only two main differences between the two sets: 1) the bigger set has 20 designs which are not included in this set, and 2) the bigger set is also just slightly larger so a tiny bit more of images are printed. They are not printed in a larger size, just less of the design is cropped. The differences in size in each direction is approximately 1/8th of an inch. The real difference is the number of cards and the carrying box. As to which to buy at the time I am writing this review, the larger set is on sale for less than this one. I found I wanted both and for different reasons. It comes down to which set works best for you and how you wish to use them. I think they are both great provided you have the proper coloring medium to get in those tiny spots. I purchased this coloring book on the basis of the description saying that the designs were original. In the sense that someone did originally create these designs, that is a true statement. However, I did not expect what I received which was a coloring book filled with designs that were licensed from Shutterstock.com. I’ve purchased and reviewed a number of these types of books and had no plans to buy any more of them. I have seen a few of these designs in other of my coloring books, so be sure to watch the video to see if you are duplicating those in your collection. The majority of the designs are new to me, so in the end, I was happy with the number of design pages I received for the price I paid. Also, and I will get into more detail about this below, the way the book was printed makes it head and shoulders above most of the licensed books that I own. There are 46 animal designs in this book. They are mostly doodle style which allows me, as a colorist, to use a wide variety of colors which would not be possible with a realistic representation of an animal. The designs range from very simple to extremely detailed and intricate with many tiny spaces to color. There are many animals in the book, including: deer, bear, owls, foxes, birds, butterflies and more. As to whether or not they are all woodland creatures, I cannot say, but they are well done and well printed. Since they are licensed, they are from a wide variety of artists. That reflects in the style of the designs and even how the lines look when you compare one design to another. The designs in this book are printed on one side only of thin, white, micro-perforated paper. The designs all stop before the perforations, so you won’t have any loss of design in you remove pages from the book. The binding is glued rather than sewn and I was able to get the book to lay fairly flat for coloring. As a nice feature, the publisher included several pages at the back of the book specifically for testing colorways, etc. This is the first of this large compilation licensed coloring books that I have bought that have perforations. Between that and the excellent print quality of the pages, I was really pleased to have bought this book. I don’t know if I will buy more of these in the future it will probably depend on the subject matter. However, the quality is good apart from the paper being too thin. Alcohol and water based markers easily bleed through this thin paper. Gel pends and India ink leave distinct and heavy color shadows on the back of the page. The gel pens leave dents on the back of the paper. Coloring pencils worked really well with this paper. The soft lead pencils were very thick without much effort and blended and layered very well. The hard lead pencils provided good color and clear lines but left heavy dents on the back of the page. Gothic Dark Fantasy is the latest great coloring book by talented artist Selina Fenech. There are 25 fantastic designs ranging from medieval maidens to rather elegant witches. I’m so happy that the book contains two of each design because it gives me the opportunity to explore each in different colorways. I don’t have to choose whether I go light or dark with each design I can do both in the same book. The designs feature lovely women with beautiful, brooding eyes. The gowns inspire me with thoughts of elegance while the bustier style outfits of the witches give me the chance to go a little more flirty in style. I own a number of Ms. Fenech’s coloring books and each is better than the last. For my first project, I choose to color a design as a tattered angel. I used a variety of medium on the design, including alcohol and water based markers and soft lead pencils. I went with pastel tones for my first go with the design. When I color it a second time, I will be sure to use deep and rich colors to give it a different look. 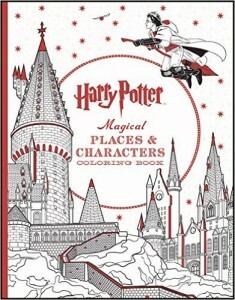 The designs in this coloring book are printed on one side of medium weight, white, non-perforated paper. The binding is glued rather than sewn and the designs do not merge into the binding area. You can easily cut pages out if you wish to do so without any loss of design. I was able to get the book to lay flat for coloring purposes. 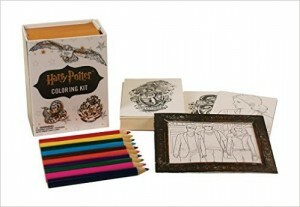 The artist has placed a frame around the majority of the designs in this coloring book. The few that do not have frames have finished elements. I really appreciate when an artist includes this thoughtful touch. It makes it easier for me to complete the project with a finished look and saves me time, trouble, and especially ink. Alcohol and water-based markers bleed through the page. Gel pens and India ink pens leave shadows of color on the back of the page. My gels pens also left dents on the back of the page. Coloring pencils work well with this paper. My soft lead pencils went on nice and thick and layered and blended well. My hard lead pencils provided good color and thin lines but they did leave dents at the back of the page. For my coloring project, I used a piece of card stock as a blotter page below the page I was working on. It kept ink from seeping through. I highly recommend that you use a blotter regardless of which medium you use so that ink or dents don’t mar the rest of the book. You can view my review with sample photos of this kit on Amazon by clicking here. I was happy to find this Harry Potter kit recently. I was a bit surprised to find out how small these were (given the size listed in the description.) I think that the larger dimensions must refer to the cardboard box when it is fully open, as the cards are much smaller. I’ll provide details on the components below. The designs are very small with detailed coloring elements. I suggest only small nib coloring medium with this kit. I love the illustrations in this story/coloring book. They are beautifully done. The only issue is that there are simply too few of them. The book turns out to be as much a story book as it is a coloring book. While it is true that there are coloring opportunities on the story book pages, they are mostly filigree style illustrations. I enjoy having a few of those in a coloring book but in this case, there are quite a few. Of the 70 pages in the book, 29 are this type of story book page. Other illustrations also carry text of the story and that is how I would have preferred the majority of the book to have been done. I think that they did an excellent job with those pages but it is not what I was expecting. The designs are, as I said, beautifully illustrated. It is a very pretty interpretation of Anne of Green Gables. The story jumps around quite a bit, so it will not replace your story book but it can be used in conjunction with reading the book. The illustrations are open and easy to color but the story book page illustrations are somewhat detailed and have some small areas to color. In a few of the illustrations, the characters faces are not quite finished. I’m not sure if this was done intentionally or if we are expected to finish the facial features. I won’t be doing that, so I will have some blank faces in a few of the designs I color. I’m a bit disappointed with the number of pages of full designs but not at all with the actual illustrations. If they had put the story book pages on the reverse side of every design page, I would have been a much happier colorist. Those pages could have become my waste page allowing me to use all forms of medium on the designs. I wish publishing companies would print on one side of the page or at the very least, stop printing into the binding area. I’m always frustrated trying to bend my pages inside out and get my medium nibs into the binding. It takes a bit of the fun out of the coloring experience. Because of the variety of issues, I detracted a star from my rating though I think the illustrations themselves are fantastic. I will happily buy more coloring books by this talented designer. The designs in this book are printed on both sides of heavyweight, non-perforated white paper. The binding is glued rather than sewn. Some designs merge into the binding, some do not, and some spread across two pages. If you remove pages from the book, you will probably lose some portion of the design. Depending on the specific page, you may lose important parts of the overall design. I could get the book to lay fairly flat by pressing really hard to break the spine. Alcohol-based markers bleed through easily. However, that is the only wet medium I tested that did bleed through. Water-based markers, India ink pens, and gel pens did not bleed through and did not leave shadows on the back of the page. Larger nib gel pens (such as Fiskars, Sakura, etc.) did require additional drying time. Coloring pencils worked extremely well with this paper. The soft lead pencils went on very easily and very thick. They layered and blended well. The hard lead pencils make decisive marks of good color and did not dent the back of the page. 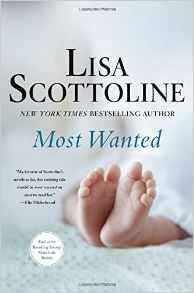 I’ve read a number of Lisa Scottoline’s books and have enjoyed them all – that is up until “Most Wanted.” The inherent problem is that the book really goes nowhere. It talks about issues with respect to infertility and that is interesting but those parts also read like a white paper on the discussion. It feels almost like the information has been picked up somewhere else and plugged into the book. Folk art and hand-drawn easily describes two of the things I look for most in coloring books. I love the whimsical and endearing style of folk art and any design which is hand-drawn gives me an assurance that the work is original and that I will (hopefully) see the vision that the artist set out to present. This coloring book has both of these criteria and is a book that I will really enjoy coloring. The designs are in two sizes. There are 22 which are full page designs and then there are 20 which have been sized down to note/greeting card size. The artist gives permission to allow you to make as many copies of the smaller size as you wish. That way you can put the design on heavier card stock and create actual cards. The designs are printed on one side of typical CreateSpace paper. That is to say, thin, white and non-perforated. It is an okay paper for most coloring but not a quality grade. It’s something that I have come to accept with CreateSpace published books as it is the vehicle by which artists can self-publish their designs. The binding is glued so you will have to cut pages out if you want to remove them. The designs do not merge into the binding, so you will not lose portions of the designs if you remove them from the book. The artist has included a waste page behind each of the design pages so you won’t have ink seeping through. If you use alcohol-based markers, I still suggest heavier weight paper as I have had these types of marks bleed through two pages of regular weight paper. You can get the book to lay flat by breaking the spine somewhat. All markers, both alcohol and water based bleed through this paper. India ink and gel pens leave distinct shadows of color on the backside of the page. Coloring pencils work well with the soft lead blending nicely. The hard lead pencils leave dents on the back of the page. I will use and I highly recommend that you use a heavier weight blotter page. I like the idea of the extra page but as it is the same thin CreateSpace paper, it can only go so far. You should test your choice of medium to see if it is sufficient for your needs. I was provided a free copy of this coloring book for test and review purposes. I will provide a comparison between this book (the US version) and the UK coloring book at the end of this review. The pictures and video in this review are only of the US version unless otherwise noted for comparison purposes. I’ve included one photo with both books to show the different colors of the page. The UK book is at the bottom and the US book is at the top of the photo. This is a beautiful coloring book which presents Alice’s Adventures in Wonderland in a wonderful way embracing both the oldest illustrations (apart from this Lewis Carol did himself for a very limited audience) and new and modern images which are all married together to create a new way of looking at an old favorite. The original illustrations from the MacMillan version of the book by Sir John Tenniel are used, along with quotes from the book. While most of the designs involve the characters, there are a number of wallpaper type designs. In this book, I actually enjoy those as much as they have chosen to use characters in a fresh and fun way to create these repetitive designs. The coloring book is well made with flaps on the front and back of the attached cover with coloring opportunities on all sides. The paper of the cover is slick, so you might have to choose medium carefully for those areas. The cover has a partially colorized version of Alice but the rest of the cover is done in black and red on slightly off-white with touches of beautiful gold foil. The designs are printed on both sides of the heavyweight off-white non-perforated paper with many designs spanning across two pages. The binding is sewn rather than glued which means you can remove multiple pages by snipping through a few threads. Designs do merge into the binding area and there are two-page spreads in the book. In my book, the pages line extremely well, so I will not be removing pages from the book. I find that lining the two page designs up after removing them becomes very difficult. I can easily get the book to lay fairly flat for coloring purposes. I test my coloring books with a wide variety of mediums which I will list in the comments section of this review. I went back and performed the exact same tests on both the US and UK versions to be able to give a proper comparison. All of my alcohol-based markers bled through this paper. My water-based markers were mixed with fine tips leaving color shadows but ultra-fine not bleeding through. India ink pens did not bleed through either. Gel pens did not bleed through but bigger nib pens did require extra drying time. My coloring pencils worked excellently with this paper. The soft core went on thick with great coverage. They blended, layered, and burnished well. The hard lead pencils made good precise lines and did not dent through to the back of the page. Much as I enjoy using alcohol-based markers, I won’t be using them in this book. I will use a mix of water-based markers, gel pens and coloring pencils so that I can color every page of the book. If you want to use alcohol-based markers, they look great on the page but you will be sacrificing the backside of page you are working on. The books weight essentially the same, with the UK version weighing 1.11 pounds and the US version weighing 1.10 pounds. They are the same size at 11 x 8 15/16 x 3.8 inches. The images are all the same, though there are minimal cropping differences between the two but nothing that makes a huge difference. The one real item of note that is different between the two is that the paper the UK copy is printed on is a fairly bright white. The US version is printed on an off-white shade. The inside of the cover of the UK version has black line printing on white and the US is white on an almost cream color. Also, the copyright page is different, of course. Coloring medium worked as well for both versions of the coloring book. All in all, unless the color of the paper makes a big difference to you, I don’t see any reason to prefer one book over the other. I would be happy with either book. I purchased the UK version long before there was a pre-order of the US version available otherwise, I probably would have waited to see the quality of and been extremely happy with the US version. When I first was able to pre-order Wonders of Creation there was no explanation of what the coloring book would contain. As the publisher was Zondervan, I assumed that it would be Christian or religious-based artwork. As it turns out, except for a reference to God on the introduction page and a cite for non-existent Bible verses on the copyright page, the book has no religious connotations at all. At the time I am writing this review, the product description refers to full text NIV language and 50 pages of designs. I am left wondering if somehow the extra 41 pages of designs replaced the Bible verses. Whatever the situation, there are no Bible verses in my copy of the book (as you can see once my silent page-by-page flip-through video posts.) The back of the actual book refers to over 90 pages of designs (I count 91), so I think that the error is in the product description itself. There are 91 full pages of hand-drawn designs by two very talented ladies: Cindy Wilde and Pimlada Phuapradit. There are additional coloring opportunities on the introductory and title pages. The designs are beautiful and are printed very well. While the book did not meet my expectations it is definitely one that I will enjoy coloring in for other reasons. I don’t know which artist is responsible for which design; however, I can say that I like all of the designs and that they mesh well together in the book. There are a wide range of designs, including: animals in landscape scenes, doodle animals of many types, trees and flowers, birds, fish and other sea creatures, and some lovely interpretative mandalas. Some of the animals et al include squirrels, deer, reptiles, jellyfish, crab, dragonflies, butterflies, hares, hedgehogs, elephans and much more. The designs in this book are printed on both sides of heavyweight white non-perforated paper. The cover of the book is quite lovely with very colorful flowers and has matte deep fuchsia pink foil on accenting touches. The binding of the book is glued. A number of designs do merge into the binding. There are fifteen design that spread across two pages. The alignment of my two-page spreads is mixed. Some are well done and others are off considerably. Because of the way the designs are printed in this book, I cannot recommend removing pages from the book. You will lose parts of the designs and in some cases, the loss would be important. I was able to get the book to lay open in a fairly flat manner for coloring. Alcohol-based markers bleed through the page easily. Water-based markers were a mixed results. My Tombows water-based markers did well with the brush end with no bleed-through or shadows; however, using the fine point marker tip caused deep color shadows. If you use the brush end sparingly, it might not bleed through you should check your markers and how you use them before trying them on a design to see if you get the same result. All other water-based markers and India ink pens leave shadows of color on the back of the page. Gel pens did not leave shadows but did need extra drying time. Coloring pencils worked very well with this paper. The soft lead pencils went on thick and layered, blended, and burnished excellently. The hard lead pencils had deep color and did not leave dents on the back of the page.